Anodised body and plastic grip. 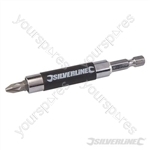 For use with 1/4" drive accessories. 1/4" hex drive. ¼" hex socket. Wide face reduces damage to work surface. 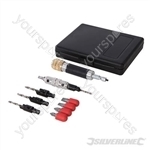 Magnetic sockets hold screwdriver bits securely. Quick bit changes for convenience. 1/4" hex drive. ¼" hex socket. Lengths 60 and 150mm. For accessing hard-to-reach areas. 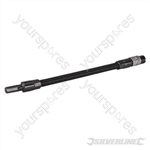 Heavy duty spring-sleeved flexible shaft. 1/4" hex drive. ¼" hex socket. 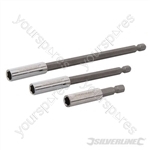 Knurled spinning guide ring. 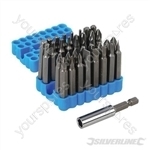 Hardened chrome vanadium magnetic bit holder. Smooth finish reduces finger damage. SDS Plus drive. Magnetic ¼" hex socket. Fits SDS Plus machines (use with 'hammer off' function). 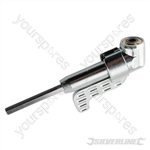 Smooth, rotating, retracting guide sleeve supports screw. Reduces finger damage. 1/4" hex drive. Magnetic ¼" hex socket. 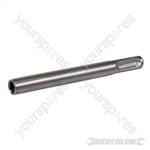 Internal bore 9mm. For accessing hard-to-reach areas. 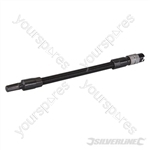 Heavy duty spring sleeved flexible shaft. 1/4" hex drive. ¼" hex socket. Knurled spinning guide ring. 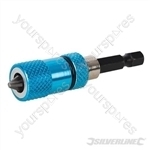 Knurled magnetic slip ring socket holds screwdriver bits securely. Quick bit changes for convenience. 1/4" hex drive. 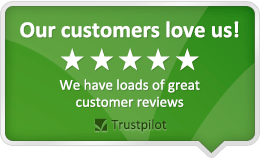 Magnetic ¼" hex socket. 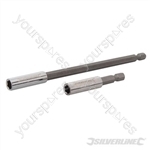 Knurled spinning guide sleeve. 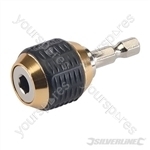 Hardened steel zinc plated body with adjustable grip collar. For driving in confined areas. 1/4" hex drive. Magnetic 1/4" hex socket. Reversible. 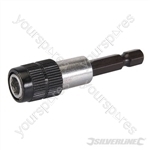 Depth adjustable bit holder with quick change chuck. Knurled adjustment and locking rings. 1/4" (70mm) hex drive. 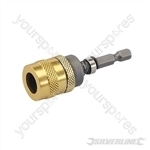 1/4" (70mm) hex socket. Wide face reduces damage to work surface. 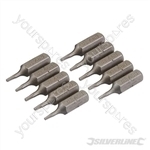 Magnetic sockets hold screwdriver bits securely. Quick bit changes for convenience. 1/4" hex drive. ¼" hex socket. Lengths 60, 100 and 150mm.